Last year, I had the opportunity to sample and review the Valentia Even Glow Vitamin C Serum--and really liked that product. 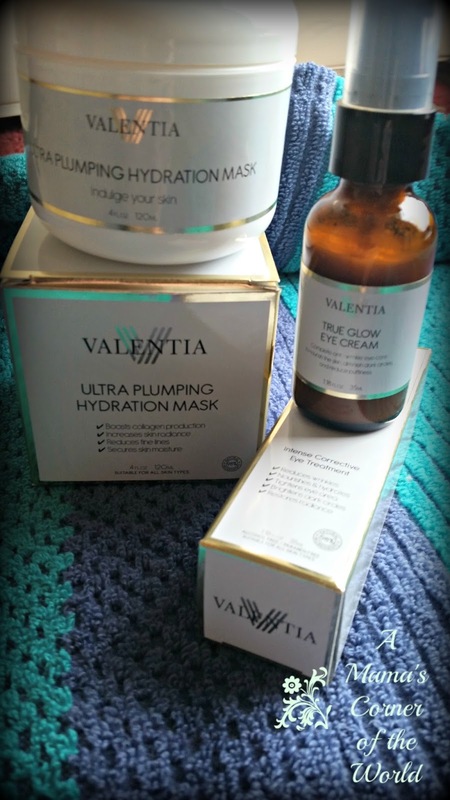 When I was recently offered the opportunity to sample and review two more Valentia products--the Valentia True Glow Eye Cream & Valentia Ultra Plumping Hydration Mask--I was excited to give the products a try! What did I think of these beauty products from Valentia? Note: I did receive full sized, complimentary samples of both of these products via my affiliation with BrandBacker. All opinions are my own. What is Valentia True Glow Eye Cream? This intense, intense corrective eye treatment promised to reduce wrinkles and fine lines, lighten dark circles, reduce eye area puffiness, and nourish & hydrate the skin around the eye. The product uses a blend of antioxident, vitamin c, organic rosehip oil, botanical hyaluronic acid, and a proprietary amino acid blend within its formulation. 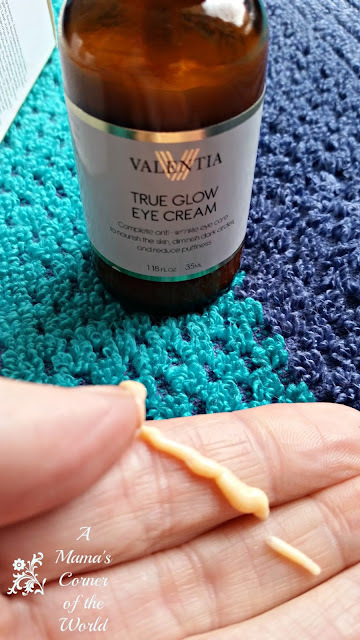 My First Impressions of Valentia True Glow Eye Cream. As is common to the brand, the packaging of this eye creamis simple and the apothecary style, brown bottle lends to both the natural, spa-like feel of the product--and to the preservation of the product as the dark glass helps prevent the product's natural breakdown. This bottle utilizes a pump to dispense a little of the cream for each use. One press of the dispenser yields plenty of product for application to both eyes. The texture of the product is rich and creamy--while the scent is mild. I found the scent to have a slightly medicinal tone--not as "fruity" as the other Valentia products I've tried. The scent fades quickly; however, and is light. My Experiences with 2 Weeks of Valentia True Glow Eye Cream. One press on the dispenser is all you need. The cream absorbs quickly and completely. I had no problems applying my normal foundation and eye makeup after using the product in the morning. After using the product daily, in the mornings, as part of my normal morning and bedtime routines, for nearly two weeks, I could certainly see a visible difference in my under-eye area. The puffiness greatly diminished and my skin was brighter and livelier. I have fairly sensitive skin--but, I suffered no redness or breakouts during the use of this product. 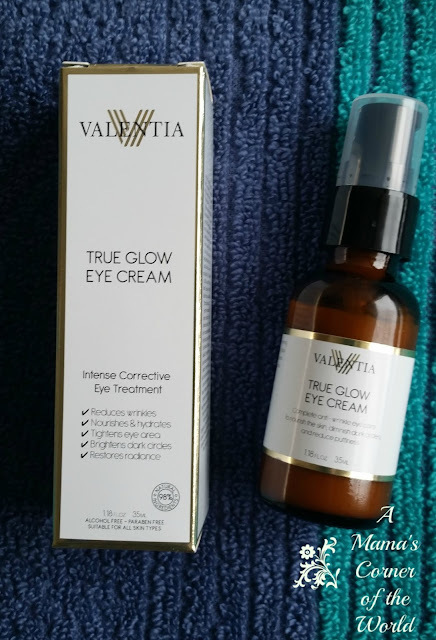 Would I recommend Valentia True Glow Eye Cream? Overall, I was pleased with my under-eye, skin response to the Valentia True Glow Eye Cream and will continue to use it. Everyone's skin is different, and personal results may vary, but I would recommend this product for those battling eye puffiness and dark circles. The product is affordable for the quality and it is quick and easy to apply. What is Valentia Ultra Plumping Hydration Mask? This products if formulated for deep, skin moisturizing. It promises to fight fine lines and wrinkles, firm skin and increase skin radiance. The product uses a Silk Protein Amino Acid blend along with hyaluronic acid and organic Sea Buckthorn Oil in its formulation. 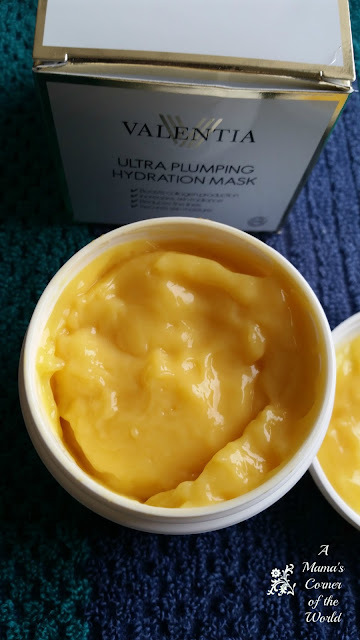 My First Impressions of Valentia Ultra Plumping Hydration Mask. The simply labeled, plastic jar has an easy to open lid and smooth finish. The product itself was a little surprising. The texture (which you can probably tell from the photo) is a bit different than only masks I've tried. The Valentia Ultra Plumping Hydration Mask is the consistency of a thick pudding. I will admit that I was a bit put-off by the texture of this at first. It was a little like sloshing on cold slime. You will certainly not over-apply this product as you won't be able to over-slather or put it on too thickly. I loved the light, citrus-floral scent; however, and gave the texture a try! My Experiences with 2 Weeks of Valentia Ultra Plumping Hydration Mask. I had some difficulty applying the product the first few times until I got used to the texture and was able to successfully cover my face with a few small fingertip "scoops". I did not notice tingling--but, instead, I experienced a lovely cool feeling over my face. It was a very refreshing feeling combined with the scent! When I use most facial masks--I can't wait to wash them off. With the Valentia Ultra Plumping Hydration Mask, I actually had to set a timer to remember that I was wearing it! The mask was very light, did not produce any tightness or discomfort and washed off quickly and easily with warm water. After using the product 2-3 times per week for nearly two weeks, I am not yet seeing much difference in my fine lines and wrinkle. I am; however, impressed by the overall glow of my skin. It simply looks healthy and more radiant. It is also soft and smooth to the touch. As with the eye cream, I suffered no redness or breakouts during the use of this product. Would I recommend Valentia Ultra Plumping Hydration Mask? Overall, I was pleased with the Valentia Ultra Plumping Hydration Mask and may continue to use it. The jury is still out on its "fine line and wrinkle" reduction properties--but, it is certainly a mask that is more pleasing to wear than others I've tried. Everyone's skin is different, and personal results may vary, but I would recommend this product for those seeking brighter, healthier looking skin. I will try to update this review at a later date as to the long-term effectiveness in my battle again the "signs of aging"! We may receive slight compensation from the affiliate linking on our site. I received a complimentary sample of this product for use in this review. All opinions are my own.